An Elgin-based business will take on a series of fundraising challenges in support of two employees. 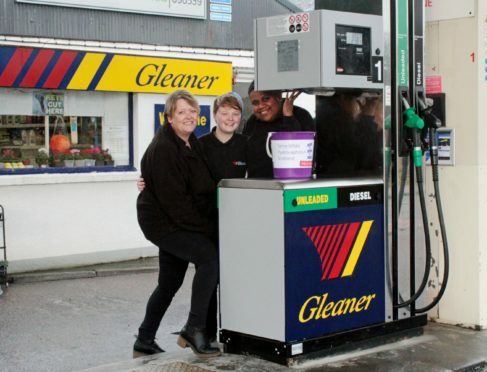 Gleaners Oils will be raising money for Spina Bifida Hydrocephalus Scotland (SBH Scotland) to support two colleagues whose daughter died. The service station network has chosen SBH Scotland as its nominated charity of the year, with employees taking part in a number of events to boost funds. The cash will help the charity provide personalised support to young people, and their families, affected by the lifelong conditions of spina bifida and hydrocephalus. Marion Davies, 49, who works at one of the firm’s service stations in Fiddes, near Stonehaven, started fundraising for SBH Scotland after her baby died at just three-and-a-half-months old. Her husband, Chris, is also a Gleaner employee. Mrs Davies said: “After Samantha passed, I wanted to do something to support other families affected by the conditions. I was introduced to SBH Scotland and started fundraising for them straight away. Now she has roped in some colleagues to help boost funds further, and they have already held a a bake sale and a pyjama-week – with some also abseiling from the Falkirk Wheel.